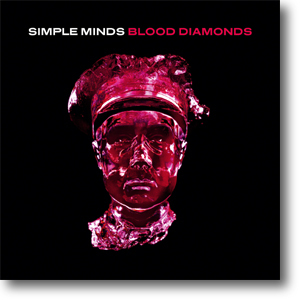 Blood Diamonds was the second, promotional-only single to be released from Celebrate: The Greatest Hits +. Its release was prompted by the desire to keep Simple Minds on the radio, especially to promote the arena gigs at the end of the year, and specifically for their appearance at Radio Two's Live In Hyde Park. It was issued as two promotional CDs in August 2013. The familiar RFC officer artwork was now stained blood red by graphic designers Peacock to reflect the title track. The single track promo CD simply featured the album version of the song. The two-track promo CD also included a live version which was recorded at Wolverhampton as part of the successful Greatest Hits + UK tour. The Wolverhampton track was the Concert Live mix, which had been released on various double live CDs some months previously. Some copies had press release information stuck to their sleeves. It was the first Simple Minds release to include the logos of both Virgin and Universal. A release date of the 16th September was given on the press release stickers but nothing else appeared. A remix by John Foxx And The Maths was issued as an Internet-freebie the same day the band played at Koko as part of Virgin Records' 40 Years Of Disruptions anniversary. The John Foxx And The Maths remix later turned up on a Australian single promo.